I have been spending some time painting turtles this long weekend. As I tried to capture that texture it wasn't long before I was making a textured canvas. It's like a mosaic as you design each section. Take a piece of corrugated cardboard and cut out a turtle shell shape. Gather some tools to texture the drywall compound. I use bubble wrap, lego pieces work well, combs, I also recently found this textured craft foam. Take some drywall compound and place on a recycled plate. Spread on the shell. You can use a plastic spatula (hardware store) or just your finger. Because I will be adding individual pieces to the shell I don't texture it. On some thin cardboard (cereal or cracker box) spread on some drywall compound and then use tools to apply texture. You can do a big piece that you will later cut into smaller pieces. and texture each one separately. Here I am using plastic wrap to add wrinkles and a wooden skewer to add lines. Set aside to dry. It takes about 6 hrs. While you drywall compound is drying paint your canvas or cardboard substrate (base). If you are using cardboard prime with a coat of gesso. I wanted some different textures for the flippers and feet. On some light cardboard I did 2 different techniques. On the first I painted it a light linen colour and then added crackle medium. Set aside to dry. On the other piece I painted it the same light linen colour and then laid a piece of cheesecloth on top. I added more paint on top to 'stick' it in place. I also wanted some textured paper for the kelp. Using gesso I 'glued' tissue, streamer and old book pages to a piece of heavy paper. You could also use white glue to do this. 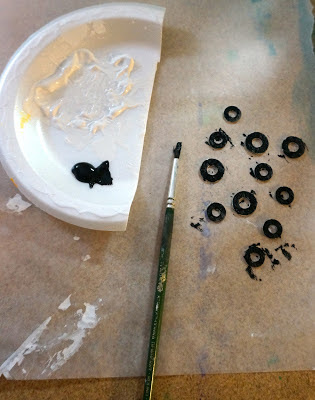 While my gesso was out I added some to my metal washers. This will allow me to paint them with acrylic later on. When my drywall compound dried I added colour to my shell pieces. If you did one large piece cut out the individual shell pieces before you paint. If you wait you'll find your paint gets scratched off as you cut. Paint the large shell shape as well. Make it a contrasting colour to your shell pieces, like grout on a tile floor. I also painted my cheesecloth piece with watery brown paint. I did the same with my crackle medium piece. Be sure to follow the directions on the bottle regarding the timing for this. I painted my metal washers black. Paint the heavy paper as well. I used green, blue and a touch of yellow. I've been playing around with spray inks so I added a little as well. From the heavy paper cut some kelp and glue onto the background with tacky glue. From the cheesecloth and crackle cardboard I cut the flippers, feet and head. I used the large shell as a guide to glue them in place. I then glued the large shell piece on top. 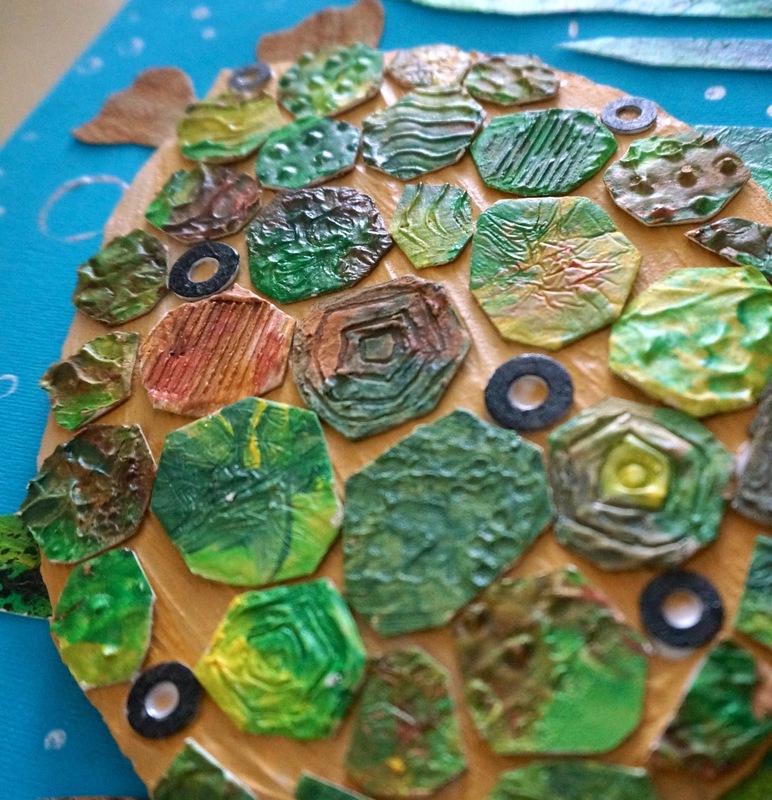 Start to glue on your small shell pieces. If you lay it all out first it is easier. Start with your largest piece in the centre and then work around it. With my sharpie pen I added some details to the face. The background needed a touch of something so using a straw, end of a skewer and a cap I added bubbles in different sizes with white and silver paint. Add a coat of Mod podge to seal and give you that nice shiny look. That's it. You could always add a poem or text to take it further. where in the world did you get the textured craft foam? I found it in Michaels with the ever increasing expanse of craft foam. I could not find it in white only in a 5 colour pack. It's pretty thin so I will be gluing it on cardboard or wood to make a better stamp. Can't wait to try it in clay and printmaking. So cool! I love turtles and love what you've done with this! I love your artwork. I have never attempted mixed media but this looks like fun. I do watercolour. OMG! This is so fabulous! You are so talented! I love turtles. I even have a turtle license plate for my car. Here in Florida they have dozens of special plates for different things that cost a little extra with that extra going to the particular group you have. Mine goes to the Save the Turtles. I think just about all of your creations! I'm crafty but not nearly as creative as you are. Thanks for all your wonderful tutorials!!! Thanks for a fantastic project idea! You are wonderful! Thank you for your blog! I love this project! In the list of materials, the size of the canvas is not given. My guess would be 9x12, but can you please clarify the size? Thanks! It's 8"x10". I buy canvas in the super value pack at Michaels for school so pretty much every project on a canvas is 8X10.